Cash, ConnectCard, passes, transfers and tickets are accepted as payment on the Monongahela Incline. Adults: $2.50 cash fare one-way, $3.50 round-trip (purchase a continuation transfer, must be used within 3 hours). There are Connectix ticket machines in both the upper and lower lobbies which take credit cards or cash. 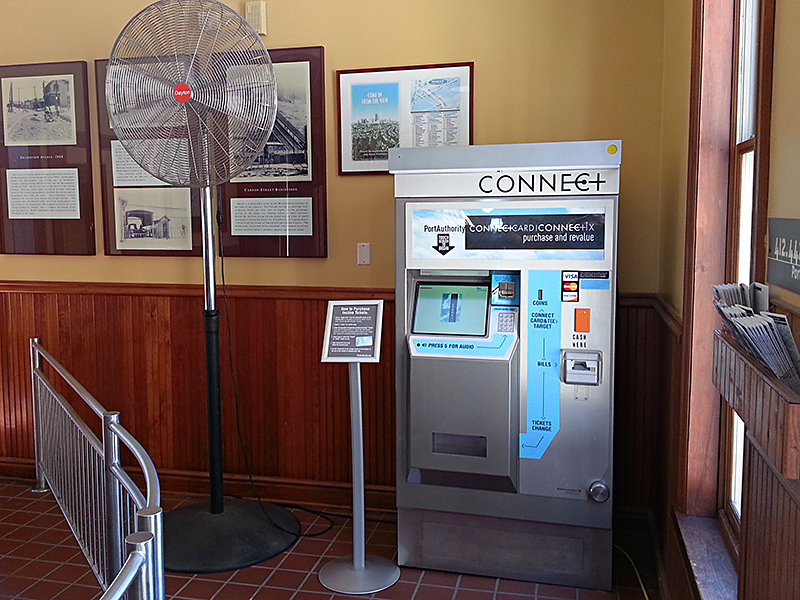 There is a ticket machine in the lobbies of both the upper and lower stations. 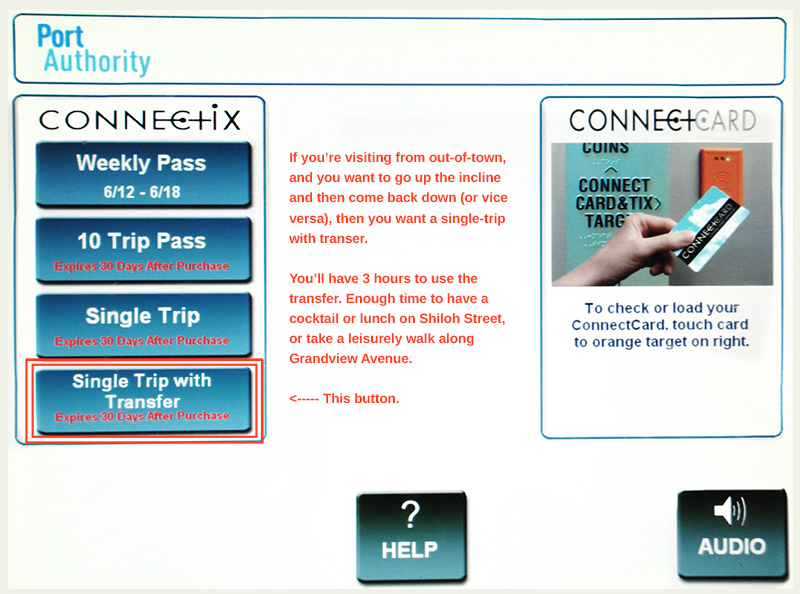 This is a screenshot of the 'Connectix' machine (with an additional note for tourists added in red). Pittsburgh visitors will generally want a 'Single Trip with Transfer.' This will take you up the incline and back down again (or vice versa). Pro Tip: Bring Cash (it must be exact change for your party, or you'll have to use the machine). On weekend afternoons, the Mon Incline tends to have a lot of out-of-town visitors, which can cause a queue of people at the lower station ticket machine. If you bring cash (again, exact change), you don't have to wait in line at the ticket machine, just proceed to the steps on the side of the next arriving car. There's a blinking on light on the side with the arriving car, or you can just look through the window to see which way the cars are moving. * Beggining January 1st, 2017, the fare structure is going to be simplified for the entire Port Authority Transit System. We'll keep you posted on how they affect The Mon Incline when that's announced.